I have been away from home for three days this week, for work purposes. So today, of course, I had to have a good look round the garden to see what was the latest state of play. Fortunately, the weather conditions this morning were ideal for the sort of photography I like best -- sunny but moist and misty. 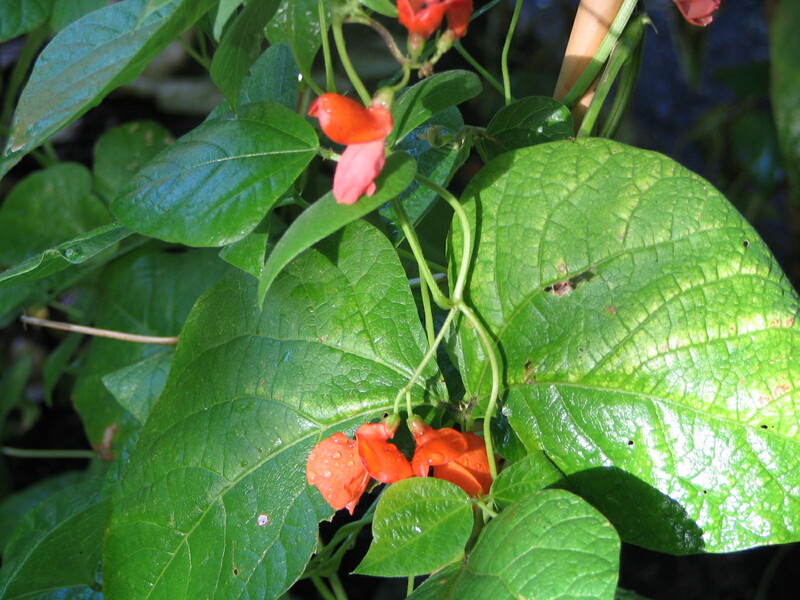 The Runner beans won't admit that the Summer is over. They are continuing to produce flowers. Unfortunately there were no Runner bean pods to pick, though I did find a handful of the Cobra climbing French beans. 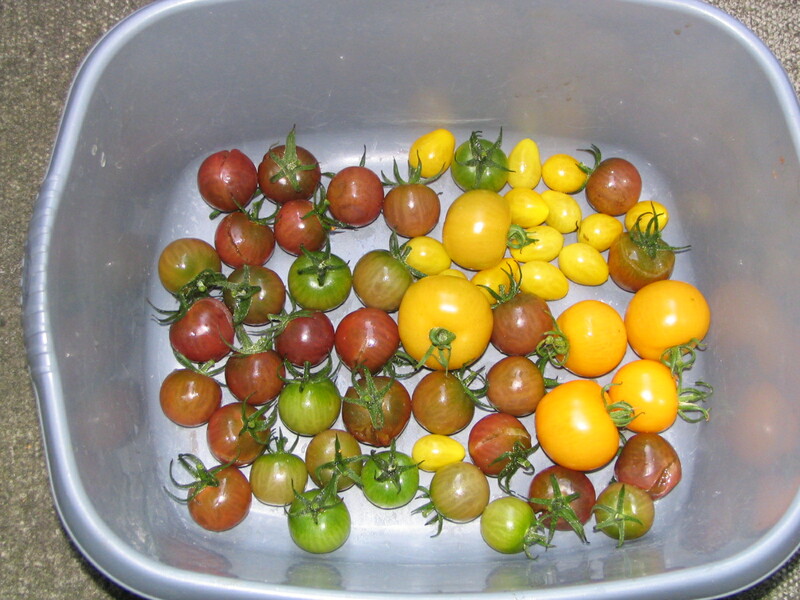 There are still plenty of tomatoes to be had, although many of the Black Cherry ones are unuseable because they have split. I have picked the remainder even though they are not ripe. I shall ripen them indoors. 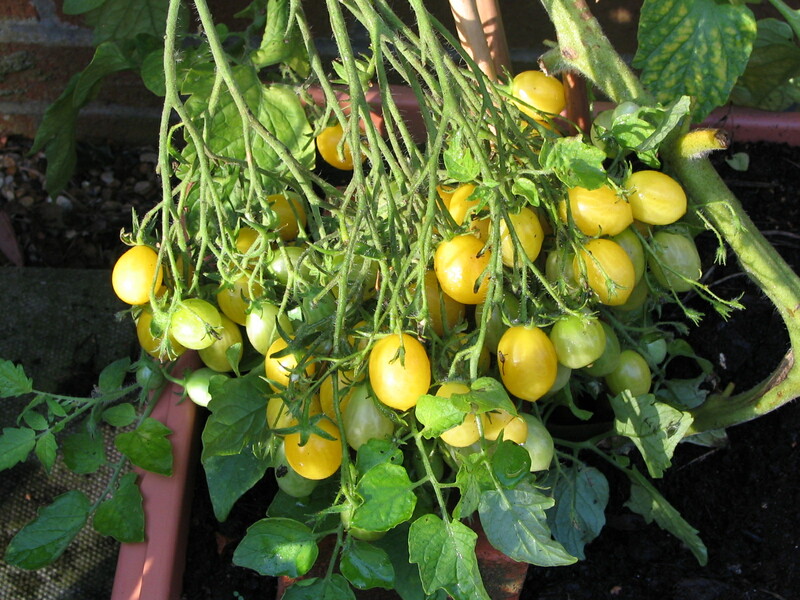 There are still a few of the medium-sized Sungella ones, and the yellow Ildi ones are continuing to ripen in droves! 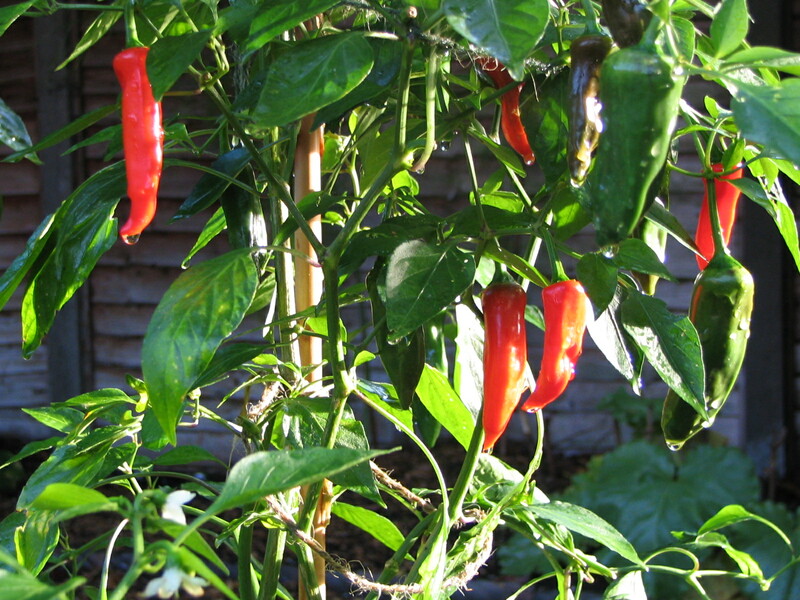 There are lots of chillis as well. Jane made a batch of Chilli jam this week while I was away. She says it's incredibly hot (in the spicy sense), and should be great for flavouring Laksa. Another way we like to use Chilli jam is on top of Ritz crackers spread with cream cheese, served as an aperitif. 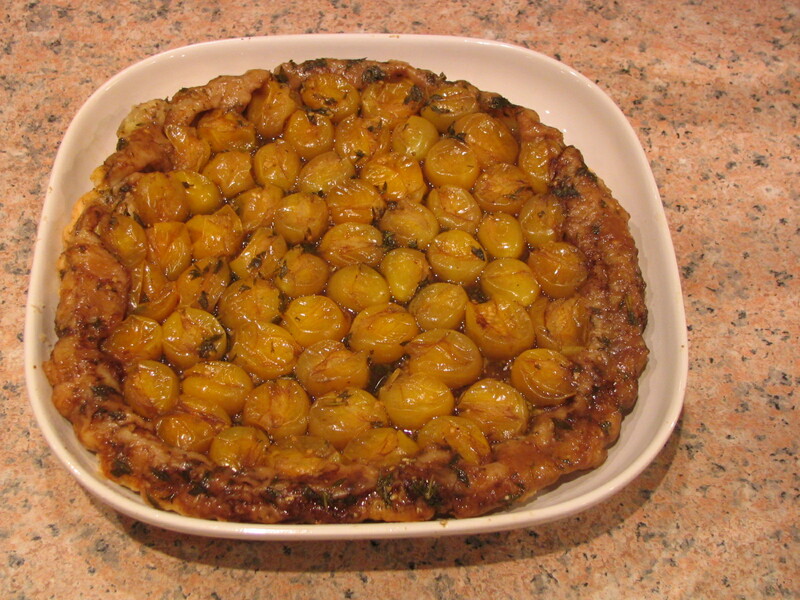 Nice with a glass of dry sherry, I reckon! 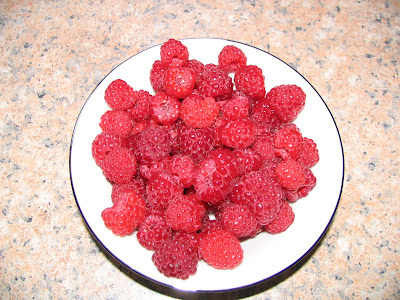 I picked another sizeable batch of raspberries (probably £5's worth at supermarket prices). The plants (they are Autumn Bliss) look very tatty now - many of the leaves have gone brown - but the fruit is better than ever. They like the cooler, wetter conditions. 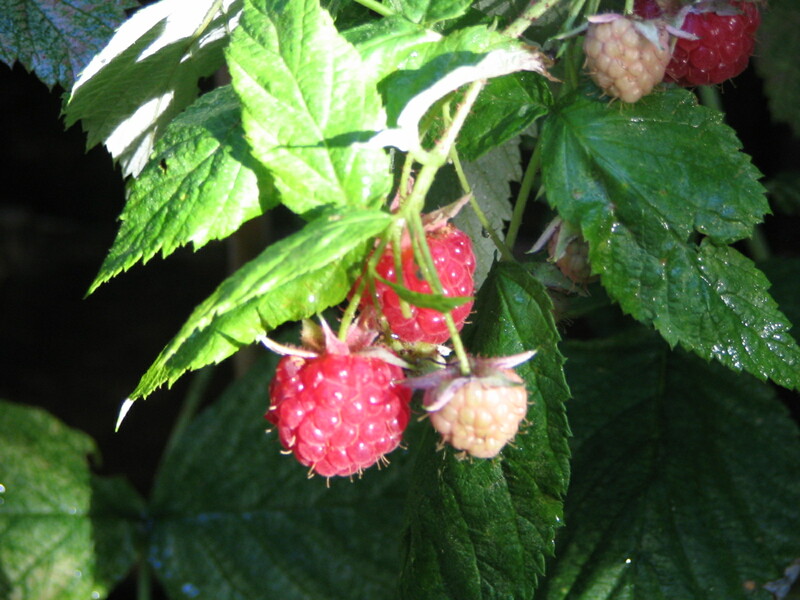 I never manage to harvest a huge number of raspberries at any one time, but we actually prefer to have little and often. This year I think we must have had a two-person helping seven or eight times. There is still a decent amount of salad in the beds -- mostly lettuces and endives, though at this time of the year we are eating less salad, which somehow seems less appropriate in the cooler weather. 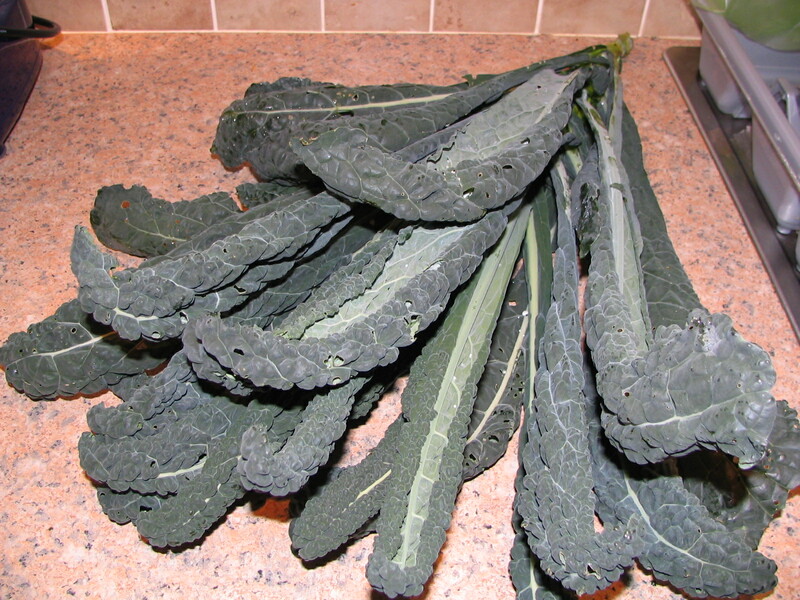 The Cavolo Nero and root veg seems more appealing. 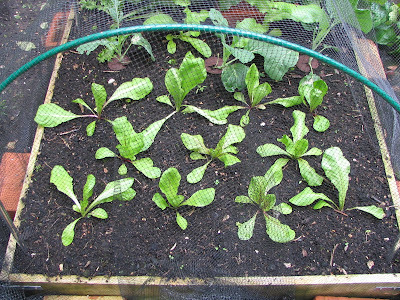 The Rossa di Verona chicory is looking OK, though it is growing very slowly. 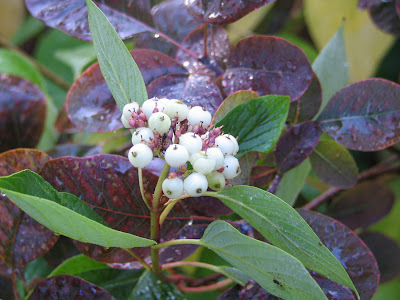 It's pretty hardy, so I hope that it will survive to maturity before the weather gets really cold. The plants in the ornamental border were looking good as well. 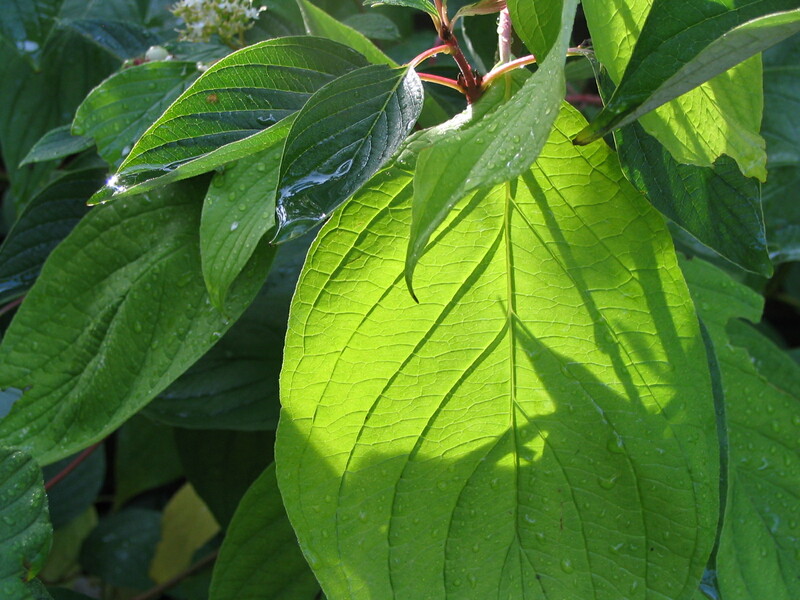 Here are some pictures of the Cornus (Dogwood) bushes. All in all, I'm pretty satisfied. Lots of stuff looking nice, a few crops harvested, and no damage to repair! It's a little snippet concerning a query I sent in about Tenderstem Broccoli. You can see the full details in my blogpost entitled "Tenderstem Broccoli - the wonder vegetable" on 28th August. Interestingly, the experts at TKG didn't actually answer my question, so I put it to my readership now: "Is it normal for Tenderstem broccoli to produce side-shoots from underground as well as as from the leaf axils? Is it supposed to do this, or was mine just a freak?" Let me know if you have any experience on this! ﻿ I am very keen to get my blog in front of a wider audience, so if you know anyone who might be interested in reading it, do please give them the details. Thanks! 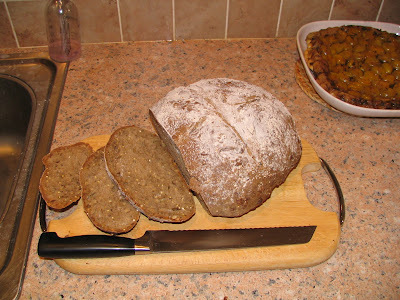 I wonder how many of you make your own bread? Not many, I suspect. You should! Making home-made bread can be a bit of a pfaff, but I would like to bring to your attention a product that has a great results-to-effort ratio. 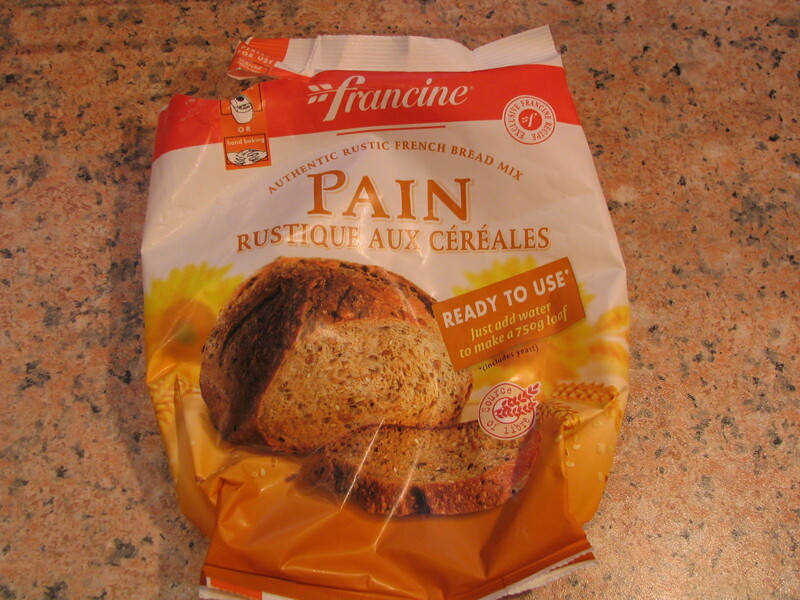 It is a brand of bread mix called Francine, which allows you to make fantastic French-style breads with the minimum of effort. In the UK you can buy these products in the supermarket (we get them from Waitrose, but I expect they are available elsewhere too). Actually there is a small range -- 3 types as far as I know: Pain Rustique aux Cereales (aka Granary); Pain de Campagne (aka Crusty White); and Brioche. NB: none of these make the "Baguette" type that most people envisage when we say "French bread". The price of these products appears at first sight to be high -- about £1.79 for each packet, which makes a 750g loaf -- but you can't compare the result with your average Medium White Sliced. It's just in a different league. You have to compare it with the best premium loaf you can buy from an artisan baker. I know that Jane is a very experienced cook, and it is hardly fair to say that with the Francine mixes she produces a perfect loaf every time, but I think she'll not mind if I say anyone could do it, because these mixes are easy to use. 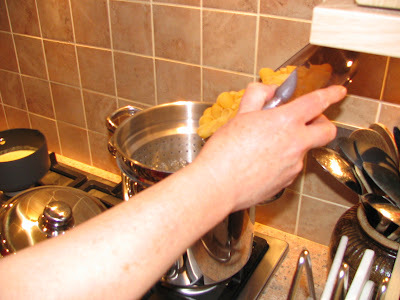 The mixes are suitable for using with a bread-maker or for hand-kneading. 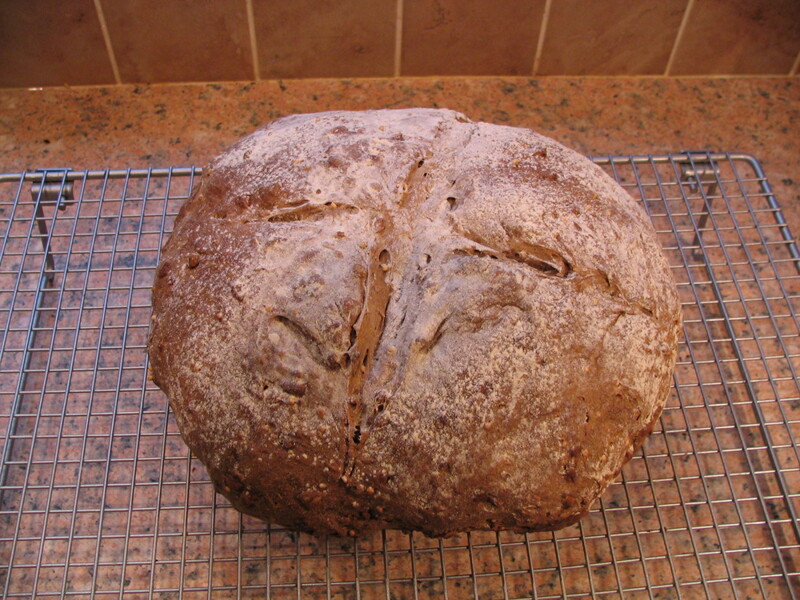 The key technique is that once kneaded the dough is proved under an inverted pyrex (or similar) bowl -- for some reason this seems to encourage the dough to rise upwards rather than outwards, in a regular shape, and it keeps the dough moist without going dry on the outer surface as it's proving. (It's almost like growing plants in a greenhouse!). 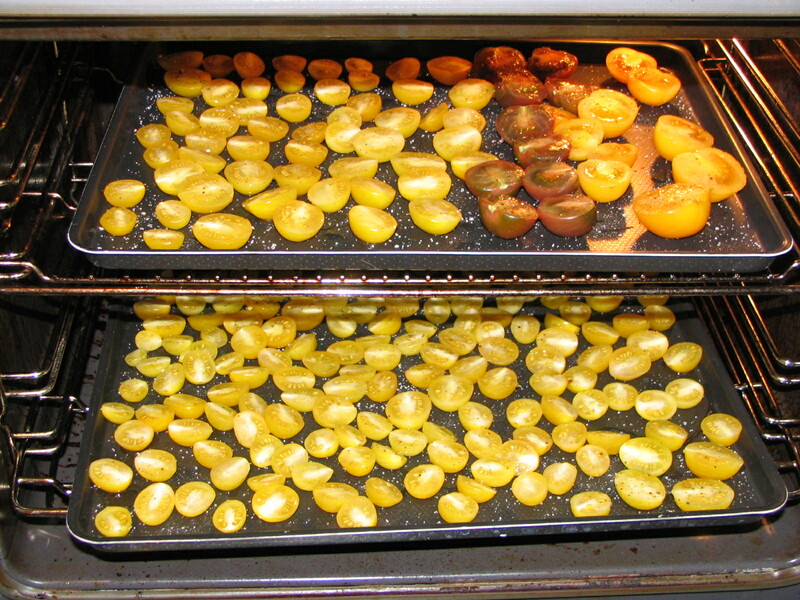 Susequently, when you cook the dough, you put a bowl of water in the oven alongside it, to increase the humidity. This too contributes to the texture, keeping it from going tough. As I said, you get a perfect result every time. You HAVE to give them a go! Why not try making the brioche version, and serving the result topped with chopped fried bacon and mushrooms? 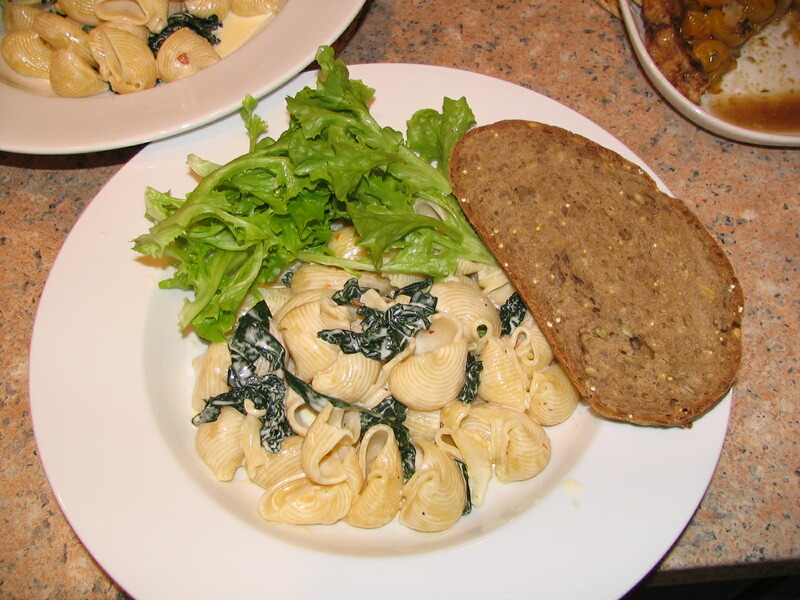 Or maybe a creamy mixture of chopped watercress and mushrooms in a sauce made with a reduced-fat "cream" like Elmlea? 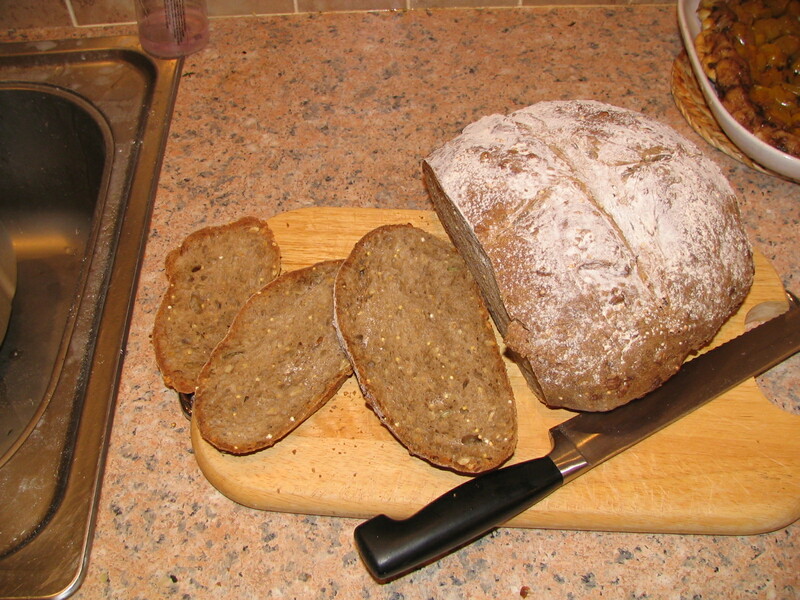 The granary-style one is best (in my opinion) with a hearty soup -- maybe made with your own tomato puree? A nice touch is to make garlic bread. Try this simple method:- prepare in advance some garlic butter, by finely crushing a clove of garlic and a pinch of sea salt crystals into a large knob of butter. Toast some fairly thick slices of the bread. Apply the garlic butter just before serving, while the toast is still warm. You can't fail to enjoy it! Ok, a question for you: "Are squirrels good things or bad things?" I spotted this one eating sunflower seeds from one of my bird-feeders, and I thought to myself: should I be dissuading it or not? 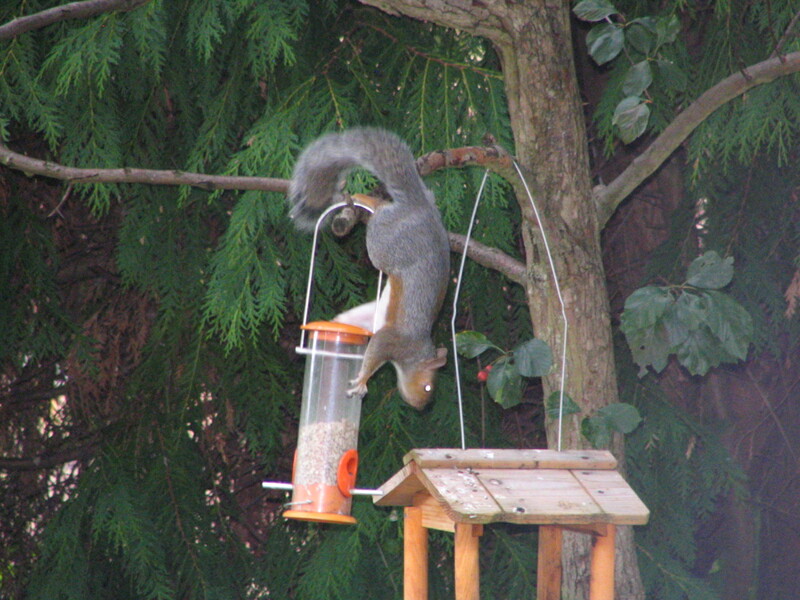 The bird-feeder is primarily for feeding birds, but is there any real justification for saying that it shouldn't also be used by other wild creatures, like squirrels for instance? What do you think? 2. They are pretty clever -- they soon work out how to steal food even if you don't want them to. Anyway, how would they know what food is intended just for the birds and what is not?? 3. They depend on the environment for their food, just as birds (and we humans) do. As humans, we have an impact on the environment, such as reducing natural habitat for wild animals. Do we not therefore have a moral obligation to help wild animals to survive? 1. They have voracious appetites, and eat a lot more than birds do. If we undertook to support them in the way we feed birds, we would soon be seriously out-of-pocket. A squirrel can empty one of those bird-feeders in about two days! 2. I don't like they way they dig holes in which they hide food for winter use. OK, I know they probably NEED to do this in order to survive, but I would rather they did it somewhere other than in my garden -- although I must say it is less of an issue since I removed the grass and replaced it with shingle! 3. Squirrels allegedly damage trees by eating fruits, buds, nuts, cones etc - even tree bark I think. Well, I have never seen them going for any of my fruit (although there is in any case precious little of that), and we have plenty of very big pine trees very close by, so the squirrels have loads of pine-cones to eat. Over the weekend I harvested another batch of carrots. This time we had the Button family coming over for dinner, so it had to be enough to feed 5 mouths (Lara eats just about as much as an adult these days!). 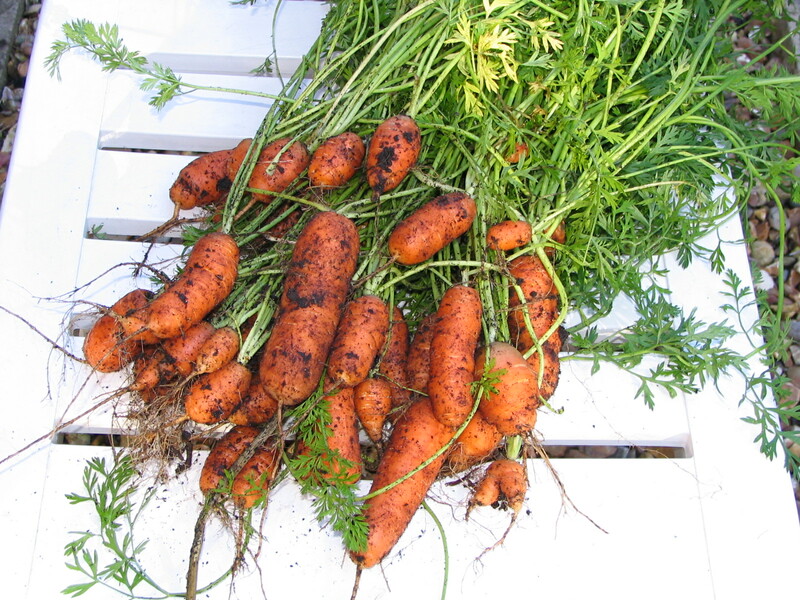 In retrospect, I'm amazed how many carrots I have harvested this year. 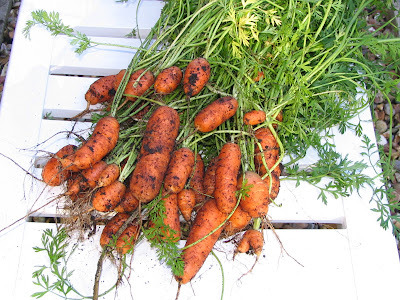 It makes a pleasant change to harvest useable carrots. In the past, my crop has consistently been destroyed by the carrot fly, so this year I have tried some fly-resistant varieties -- Flyaway and Resistafly. (See my blogpost on Roots in August). There has been a little fly damage, but not enough to constitute a major issue. The results have actually been pretty good. Not a huge crop I grant you, but then I only sowed one 2.4-metre row (half of each variety), and the carrots have almost all been OK. I would think that we have had about 12 servings so far from this small row, with maybe 4 more to come. This seems to me like a decent return on the space - especially since carrots don't really require much looking-after. At the same time as harvesting the carrots, I also pulled up the first parsnips of the season, something I had been looking forward to doing with eager anticipation. The variety I have grown this year is "Cobham Improved Marrow". 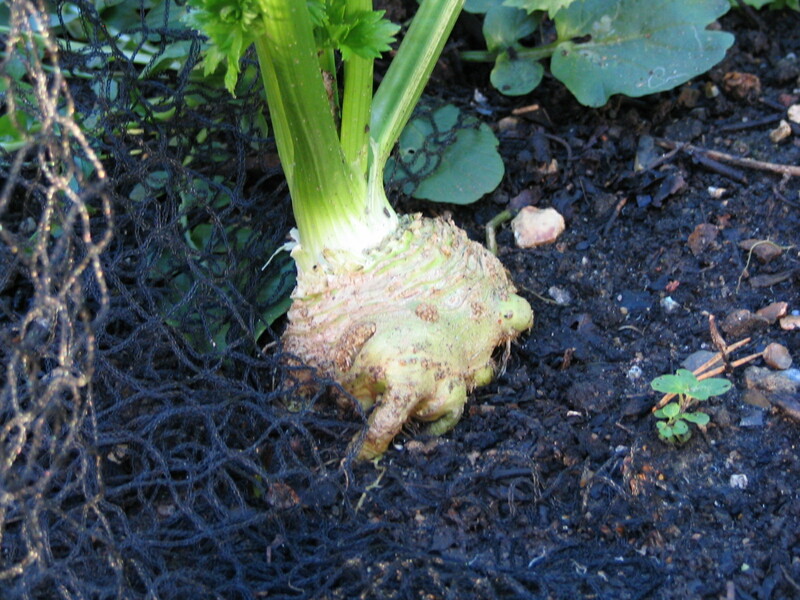 What a funny name for a parsnip! Still, I grew this one a couple of years ago and was pleased with it, so this year I gave it another try. First impressions are favourable. 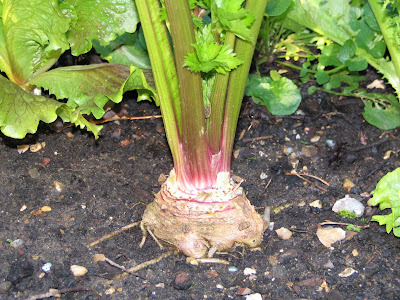 The three roots I pulled are of a decent size and reasonably clean. Isn't it funny that you have no idea what they are going to be like until you yank them out of the ground? Even the diameter of the visible crown is not necessarily a good guide -- the roots are sometimes wide at the shoulder, but very short. 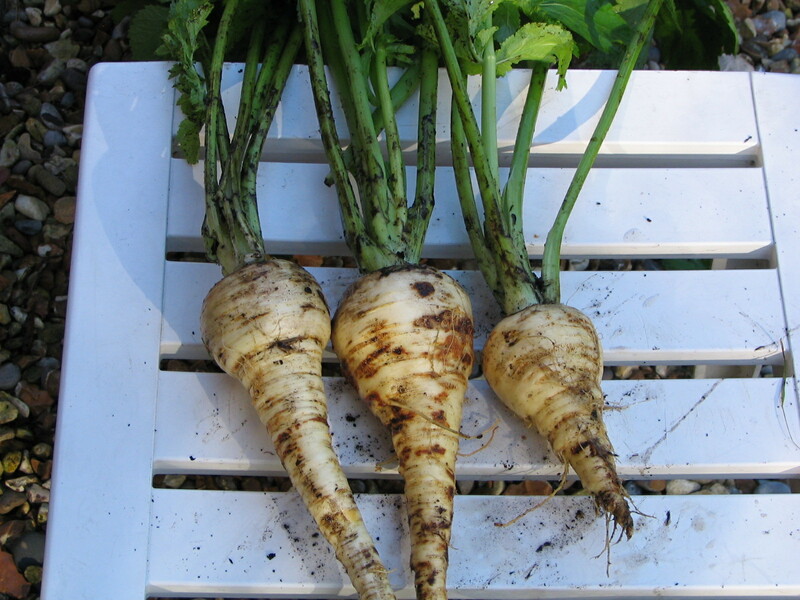 I have found that the parsnips I grow are often" "variable", i.e. they grow in all sorts of different shapes and sizes. The pictures you see on seed packets are completely staged, I'm sure. They only show you the perfect ones! Most of the ones I have grown over the years have had a certain amount of surface blemishing -- it looks like rust, but I think it is actually the sign of a disease called canker. It's not really a problem because the damage is usually only skin-deep and gets removed when you prepare the roots for cooking; it just means that I definitely wouldn't win any prizes at a veg show! 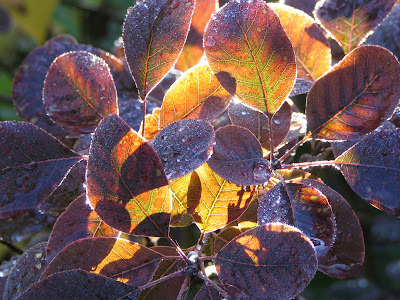 After Friday's prolonged rain, I was pleasantly surprised to see the sun on Saturday morning. Even before 8-o'clock I was out there in the garden wading into all those tasks I had been planning during the last week, and whilst we were away on holiday. 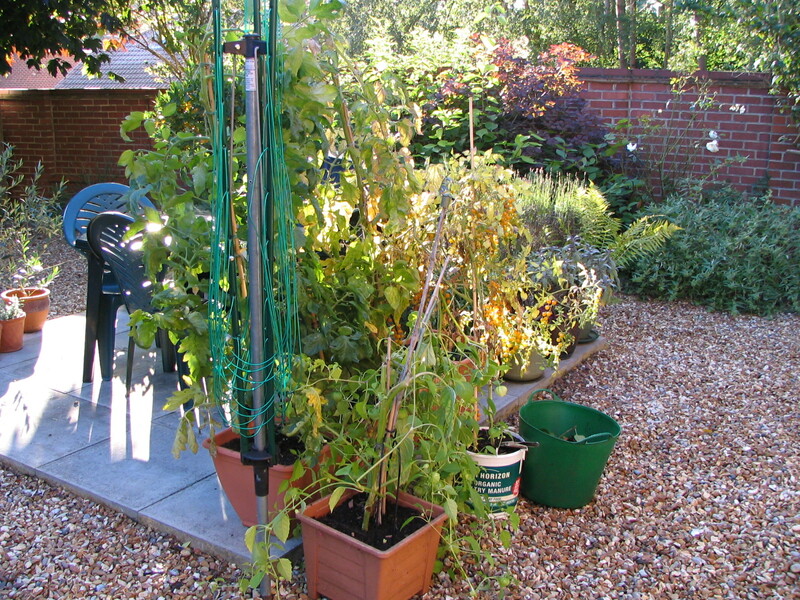 Most important was the clearing-away of most of the tomato plants. I harvested the last of the Ferline ones before we went away, so these were the top priority. 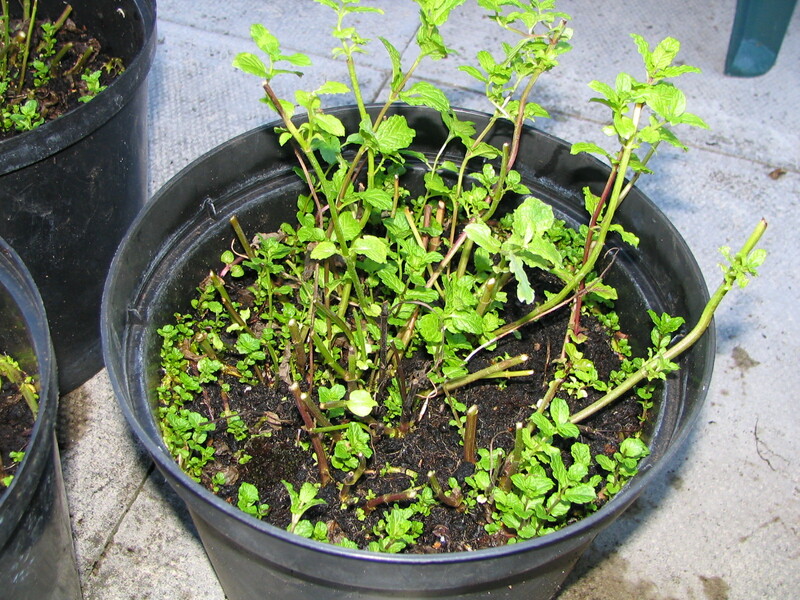 I cut the stalks and the remaining foliage into short pieces before adding them to one of my compost bins. I also decided to get rid of the Currant Goldrush plant. It seemed a shame to do this when the plant was absolutely laden with fruit, but you know my views on this already. The fruits are just not good to eat -- a minuscule quantity of flesh surrounded by an exceptionally tough skin. Another of the Tomatillo plants was also on its last legs, after a hugely successful season, so I harvested its last fruit (another 300g or so), and then it too went into the compost bin. 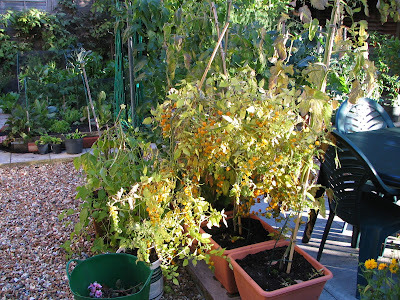 I only have one Tomatillo plant left now, and that one will probably have to go within the next week or ten days. 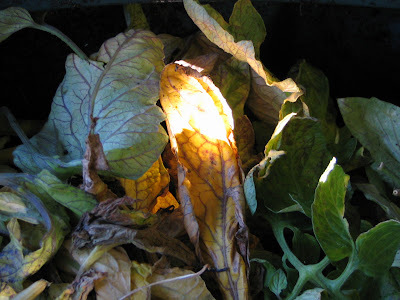 In the sunshinre this morning, I found photo opportunities even in the compost bins! what do you think of this? Sunlight makes a pretty picture even in the compost bin! 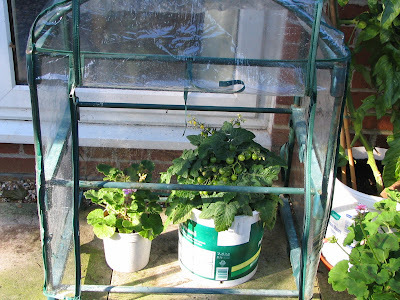 Some of you will have seen my post about Mini-greenhouses a few days ago... I felt yesterday that the time had come to protect little "Son-of-Wilma" from the Autumnal chills, so now he is safely ensconced in one of the greenhouses. Hopefully this will allow the fruit to ripen in the next couple of weeks. Another job that urgently needed doing was cutting back the Mint. 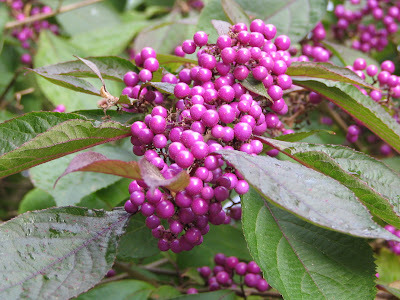 We have had a good supply of this throughout the Summer, but the plants were definitely "past it". 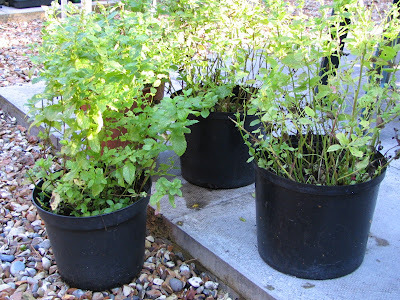 I have found that if you prune the plants hard at this time of year, they very often produce some useable new growth before the weather turns really cold, so that is what I have done this time. 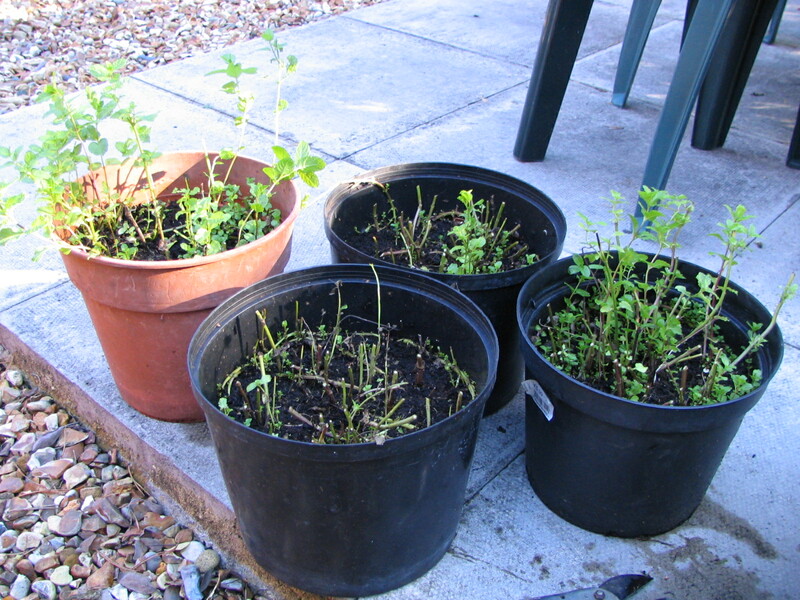 All four pots assembled ready for the "haircuts"
As well as these more significant jobs, I also did a bit of general tidying-up of the plot - things like removing a few yellowed and fallen leaves from the Winter brassicas. If you don't regularly remove stuff like this, it can harbour mould and fungal diseases, as well as providing cover for slugs. At this time of year I also have to keep picking up fallen crab-apples. Our tree produces vast quantities of fruit, most of which we cannot use, and it just drops onto the grass and the driveway, so I go round every few days and pick up another batch. Of course I then add the apples to the compost -- no organic matter is wasted on my plot! 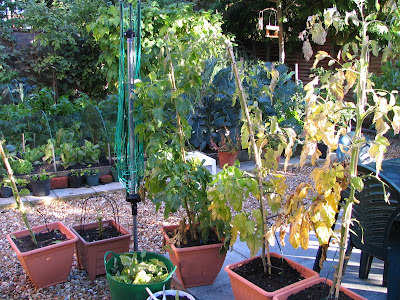 Final task was tying-in the Sprouting Broccoli plants to stop them rocking about, or in the worst case, falling over in the forthcoming Autumn / Winter weather. As I said the other day, this is only a 10-minute job, but it's best done on a dry day, because getting in amongst those huge plants on a wet day can be pretty unpleasant. You can see from my picture that I have tied-in the biggest plants to their stakes not just once but in at least two, additional places. The purple Sprouting Broccoli plants tend to grow the tallest -- perhaps five feet? The white ones tend to be shorter -- about 3 feet. When tying-in, don't skimp on the twine; wind it around the stems and stake three or four times to make a broad, strong band. 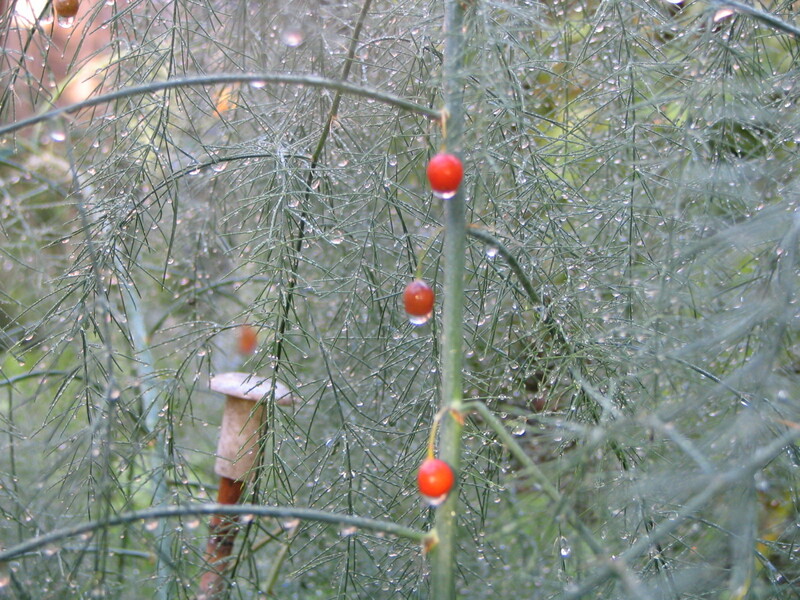 Also, try to thread the twine in such a way that it wraps mostly around the stem, and not around the leaves. So there we are. A few unglamourous but necessary tasks done. 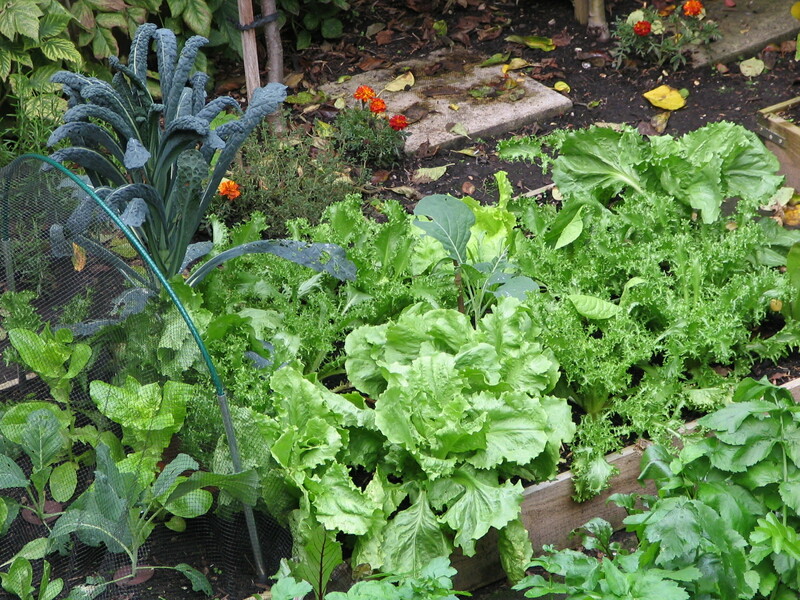 Some people only want the harvesting opportunities their plot presents, and they don't enjoy digging, weeding, tidying-up etc, but the fact is that results are often in direct proportion to the amount of care and attention you devote to your plot at all the other times too. No pain, no gain; as they say. 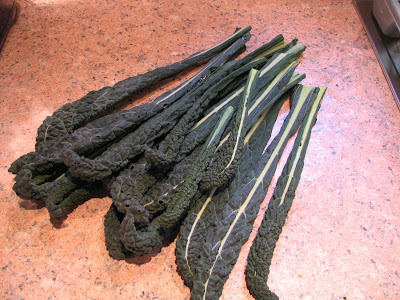 Cavolo Nero is Italian for Black Cabbage. In England it is also sometimes referred to as Black Kale. 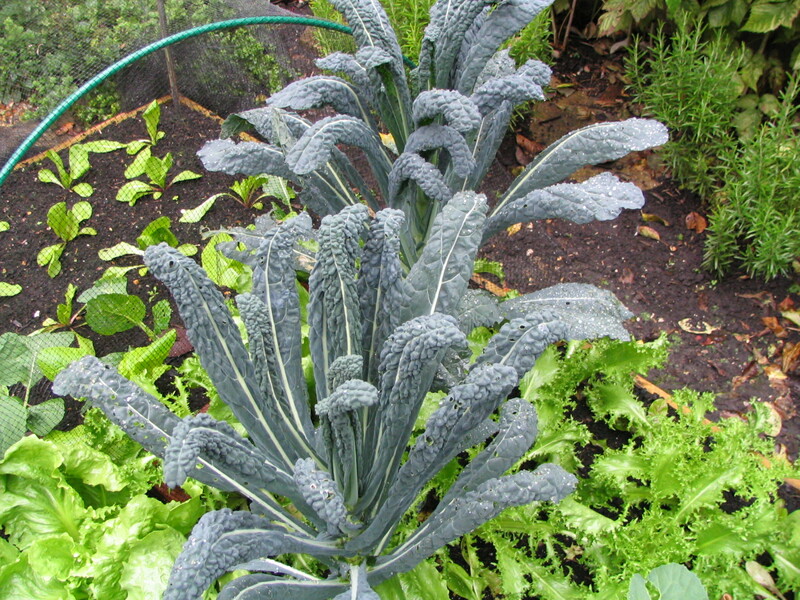 In fact I think it is much more akin to kale than it is to cabbage. Anyway, it's a member of brassica family. In England this vegetable is still treated as something of a curiosity. You can sometimes buy it in the shops, but you couldn't rely on finding it when you wanted it. This may be because many people wouldn't know what to do with it, so the demand for it is not great. Also, the fact that it is a very dark colour may put some people off, because they perceive it to be "strong and bitter" -- in much the same way as the Brussels Sprout, which as we know has always had a bad press. Actually the colour only gets really dark (and never quite black) when the weather turns cooler. During the Summer the plants will be a sort of silvery grey colour. 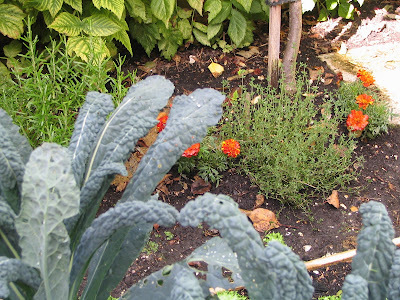 If you are gardening in the "Potager" style, with decorative plants interspersed with edible ones, you will probably see the potential of the very striking tall thin plume-like leaves of Cavolo Nero, whose dark colour can provide a lovely contrast alongside something shorter but less sombre -- like for instance some bright orange marigolds. Cavolo Nero is primarily an Autumn / Winter vegetable, and if you sow at the right time will usually be ready from about late September onwards. It certainly doesn't occupy the ground for as long as Sprouting Broccoli, which I normally sow at about the same time. 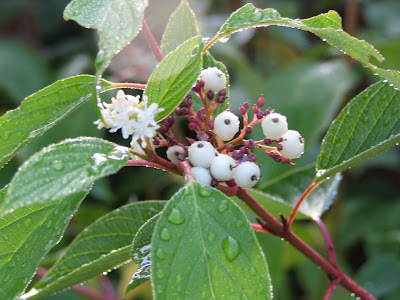 It is quite hardy too, and will normally make it through the Winter until the following Spring if you let it. 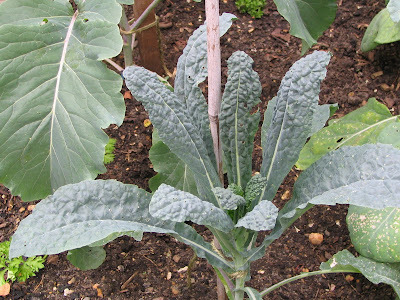 I sow Cavolo Nero seeds some time in April, prick-out the best of the small seedlings into pots of about 10cm as soon as they have a couple of proper leaves, and then grow them on in these pots until about late June or early July, when space becomes available to plant them out in their final growing positions. This is normally in the bed which has previously hosted peas and broad beans, since the root nodules of these legumes contribute a lot of Nitrogen to the soil, which will be enjoyed by the leafy brassicas. If planting is delayed for any reason, it may be necessary to pot-on the Cavolo Nero into larger pots, to stop their growth being checked. In recent years I have suffered a lot of damage from Vine Weevil larvae, which attack the roots of the brassicas (as well as the beans! 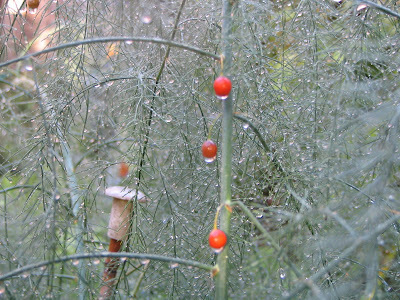 ), and this will eventually cause the seedlings to collapse and die. This year I had a try with nematodes for controlling the weevils, and have had pretty good results. 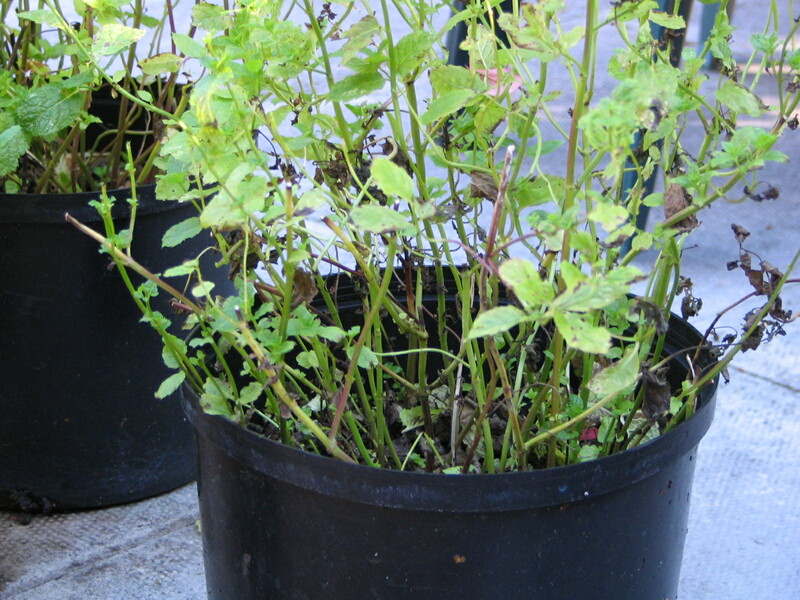 Of course it is easier to apply the nematodes (which you do with a watering-can) if your plants are in pots. 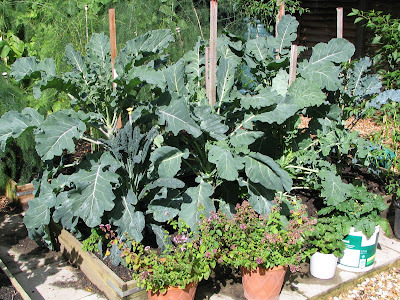 When planting out the Cavolo Nero, remember to visualise how they will look when they are mature -- particularly if you (like me) are putting them in a bed with Sprouting Broccoli, which will get VERY big. In my winter brassicas bed I only have 8 plants -- 6 Sprouting Broccoli and 2 Cavolo Nero -- and I have deliberately positioned the Cavolo Nero at opposite corners where I hope they will not be overshadowed too much by the broccoli. 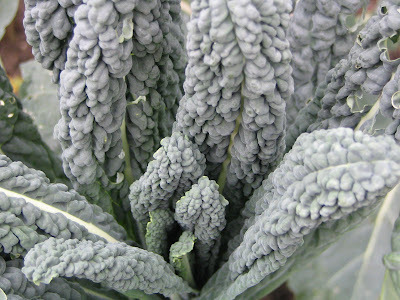 You can harvest Cavolo Nero in two ways: either cut the whole plant and use it in one go, like you would with a cabbage, or pluck individual leaves, like you would with Curly Kale. If you use the latter method, remember to pick only the middle-sized leaves. The older, bigger ones will be a bit tough, and may be somewhat ragged, but they are the ones that are contributing most to the growth of the plant, so leave them in place. 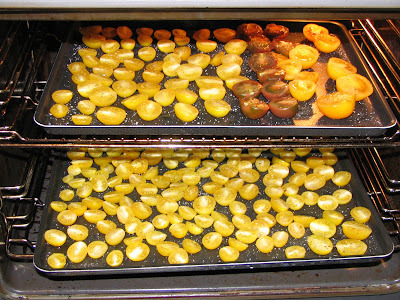 The little tiny ones, whilst they may look (and indeed, are) more appetising, should be left for the future development of the plant: take these off and your plant is finished. 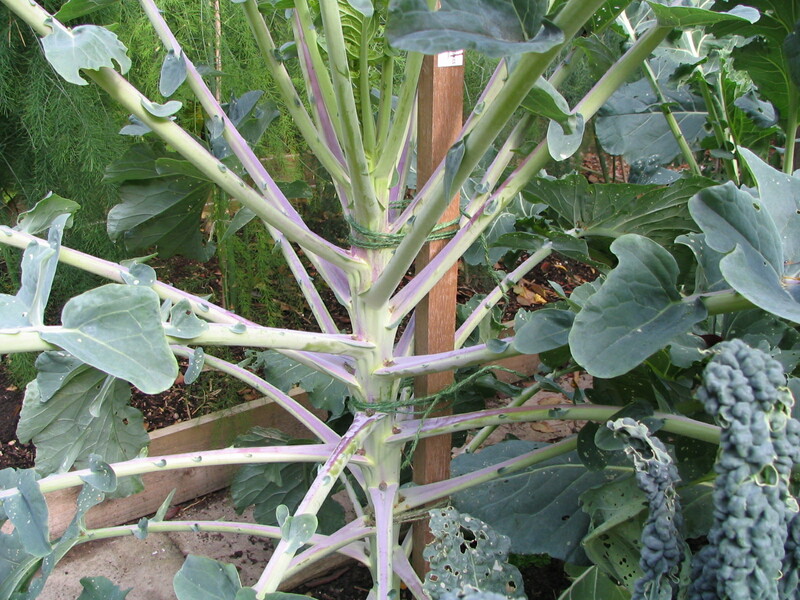 If you can afford to leave a couple of plants in place until Spring, even though you may have picked off most of the mature leaves, you may be able to harvest another crop -- the tiny flower shoots (a bit like Sprouting Broccoli) that will appear. Cut them when they are VERY small though, before they go stringy. 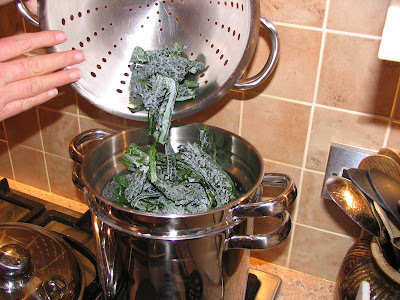 Before you cook the Cavolo Nero first wash it thoroughly to remove any dirt or bugs, because the crinkly "savoyed" texture of the leaves can harbour all manner of undesirable items. Then, if you like you can just chop the long leaves up into convenient lengths, but for optimum texture it is best to strip the soft "leafy" bit away from the central woody vein which you then discard. (You can do this easily with your fingernails!) It really depends on how mature are the leaves you have harvested. 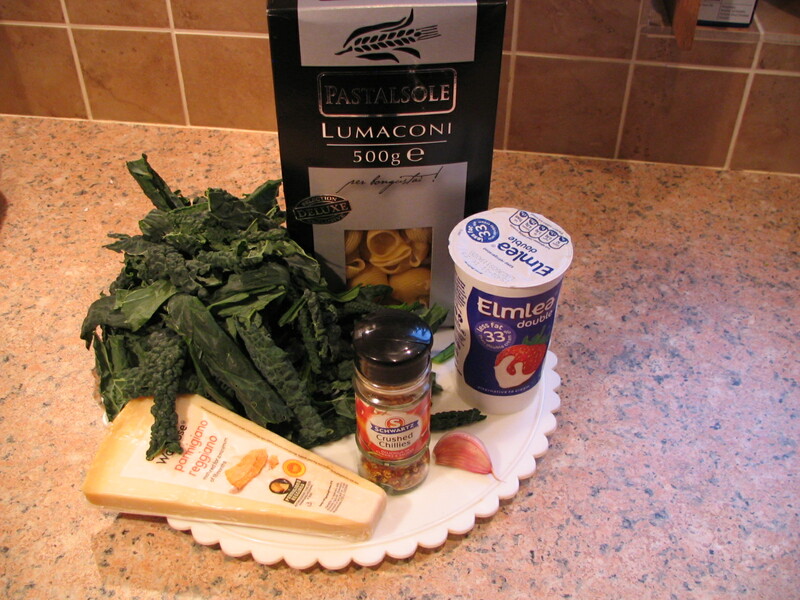 Pasta with Cavolo Nero, garlic and chilli. 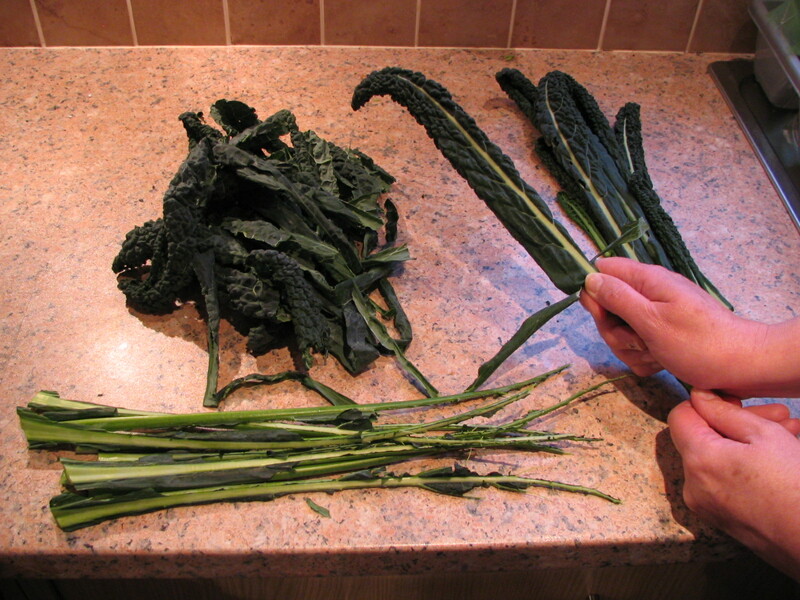 ﻿﻿A "slack handful" (maybe 10 or 12 medium-sized leaves) of Cavolo Nero -- with the central veins stripped-out, as described above -- cut into conveniently-sized pieces. About 200g of dry pasta. Approx 150ml Double Cream, or if you are dieting, a reduced-fat substitute, such as Elmlea or similar. Two or three cloves of garlic (depending how much you like it) -- bruised, but each clove left basically in one piece. A generous pinch of dried chilli flakes. Maybe a quarter-teaspoonful ? Freshly-grated Parmesan cheese, to taste. Maybe 25g ? 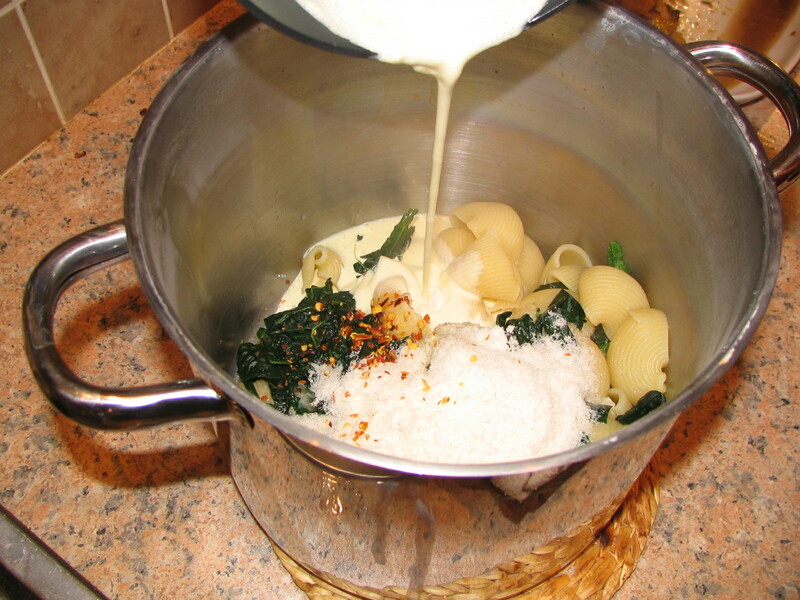 Put the garlic and cream into a small saucepan. Cook the pasta as directed on the packet, until nearly ready. When the pasta is about 2 minutes away from being ready, add the Cavolo Nero to the pan of pasta and continue to cook until tender (hopefully only a couple of minutes!). Drain pasta and Cavolo Nero thoroughly. Remove the garlic from the cream. Mix everything else (including the chilli flakes and the Parmesan) together in a pan. 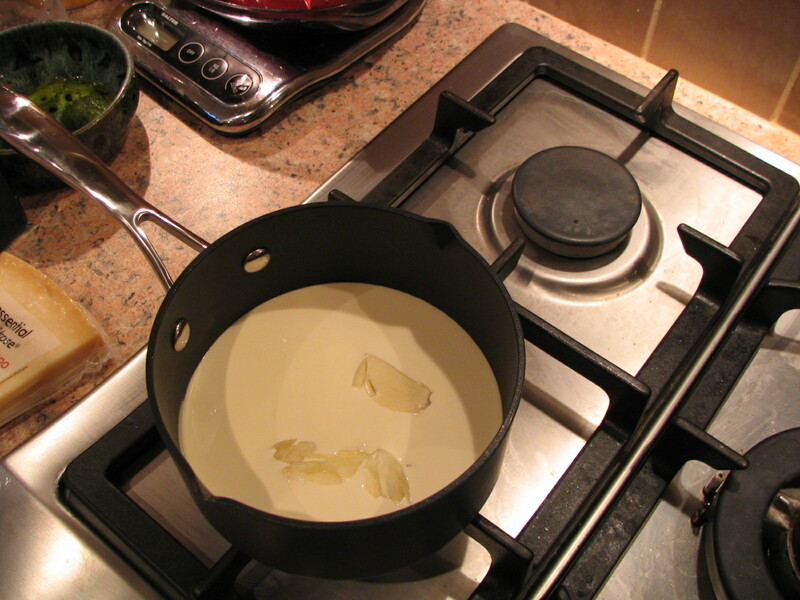 Heat gently for a couple of minutes, just to reheat the cream to serving temperature and melt the cheese. 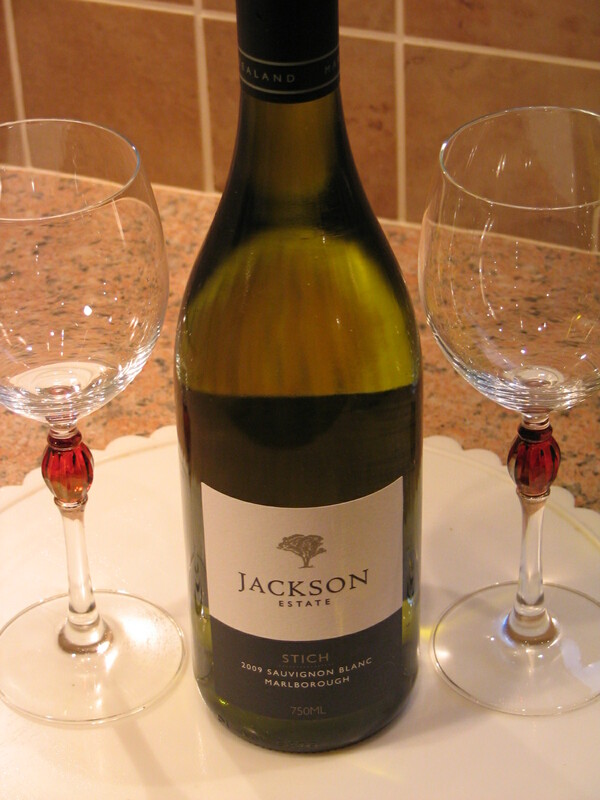 Serve with salad, crusty bread, and a robust white wine...(a New Zealand Sauvignon Blanc would be ideal). 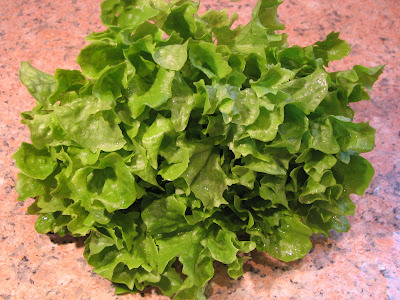 The "Salad" -- homegrown lettuce "Fristina"
The "crusty bread" -- home-made of course! 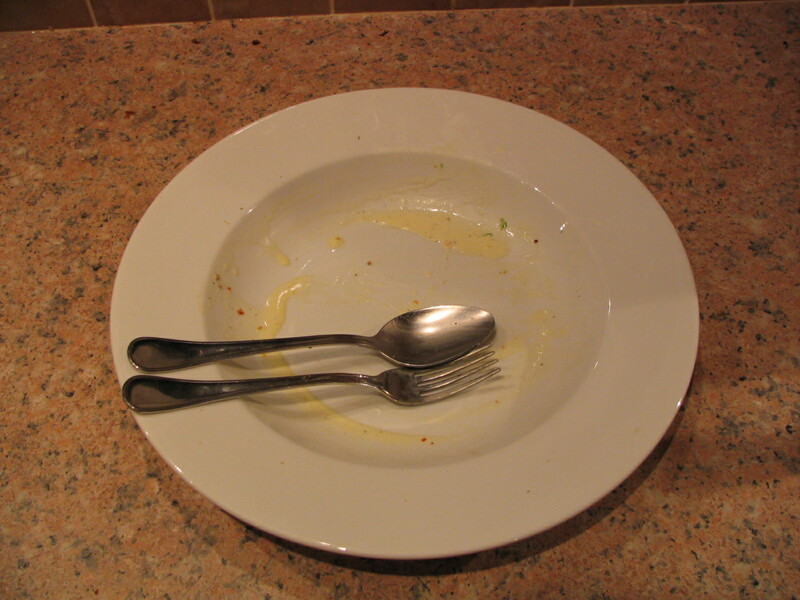 This dish is absolutely fabulous! Creamy, tasty with the subtly-infused garlic, comfortably warming with the chilli, sustaining with the pasta, and finally -- it has that mild "iron" taste of brassica without being overpowering. "Perfect". How many times have I mentioned tomatoes in my blogposts during my first two months of blogging??? I make no apology for this. 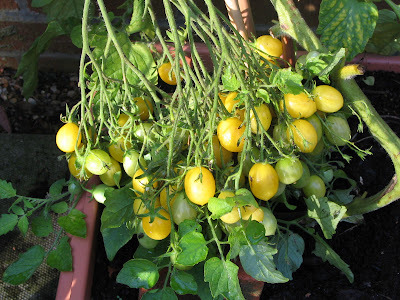 Tomatoes are amongst my favourite vegetables, and (in a blight-free year) are some of the most rewarding to grow, if only because the results are so visible. It's not like growing spuds, where you have to wait to the last moment to see what the crop is going to be like -- with tomatoes you can watch them develop day by day. 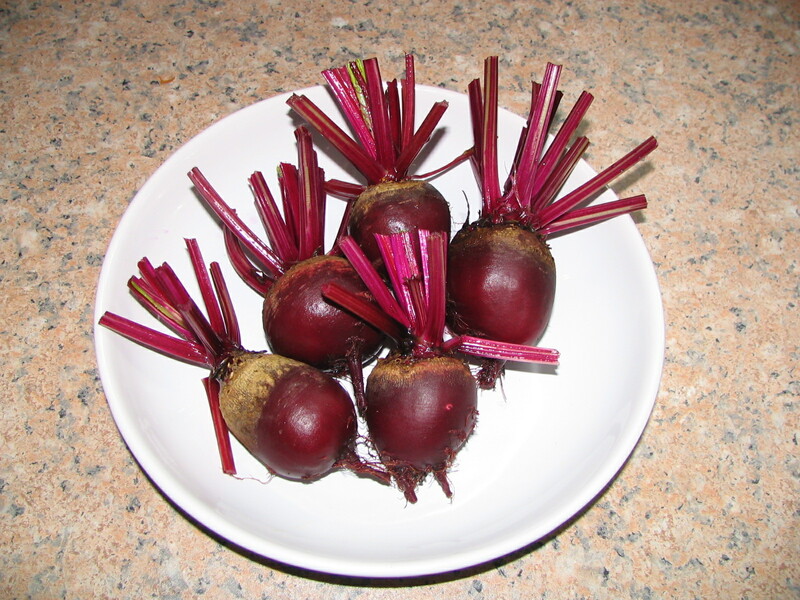 We have also had another batch of beetroot. There are only a few little tiny ones left in the bed now. I had half expected the current batch to be a bit woody, since they have been in the ground for a long while, and have not really grown much for some weeks now, but not as bit of it -- they were as tender as any of the others, which is saying something. We ate them at lunchtime with some corned beef and sweetcorn (alas, not home-grown). Both of us really enjoy the beetroot / corned beef combination. There is something about the saltiness of the beef and the earthiness of the beetroot that makes them a great match. I have also been having another close look at the celeriac. It's not exactly impressive in the size department, but at least it HAS swollen a bit. At the current rate of progress it will need about another 6 months before it gets to be as big as I had hoped! Cucumbers - a late rally? Anyone for a fungus foray?